One of the most consequential political decisions of the presidential campaign may soon take place without anyone noticing. On Monday, August 13, the Obama administration is slated to file an amicus brief in a U.S. Supreme Court case challenging the use of racial preferences in admission to the University of Texas at Austin. Though affirmative action in college admissions now barely registers as a concern among voters, the question of whether or not race should count in who gets ahead is likely to receive enormous media attention leading up to the Supreme Court oral arguments on October 10. Depending on how President Obama handles the issue—and the administration’s amicus brief will give a strong indication of its intentions—it could expose critical, even decisive, vulnerabilities to his re-election bid. But despite the many potential pitfalls, there is one option available to the President that is both morally principled and politically advantageous: Supporting class-based, rather than race-based, affirmative action. But some conservatives have still unfairly sought to racialize economic policies like health care and welfare. One need only imagine what they would do with affirmative action if the president comes down squarely in favor of explicit racial preferences. But there is a way out of the political thicket that builds on important new social science research on how best to promote equal opportunity: Obama could back preferences in admission for economically disadvantaged students of all races. If structured properly, class-based affirmative action can produce substantial racial and ethnic diversity, and it can reinforce, rather than undercut, the president’s populist message that he cares about struggling Americans of all races. With white working-class voters holding the balance in key swing states, the president’s position on race- or class-based affirmative action could help them determine whether this constituency votes their race (and sides with Republicans) or their class (and sides with Democrats). To date, the president has given mixed signals on racial preferences, wanting to neither offend his base nor anger swing voters. On the one hand, the Department of Justice supported Texas’s affirmative action program in the lower courts. On the other hand, when asked whether his own daughters, as privileged African Americans, deserve affirmative action, Obama responded that they do not, and that low-income students of all races deserve a leg up. Unlike racial preferences, which are disfavored by most Americans, income-based preferences garner 2:1 support, perhaps because Americans realize that today, the obstacles to a student doing well are primarily economic rather than racial in nature. Recent research at Stanford University looked at demographic gaps in test scores going back more than 50 years. It found that the white/black gap used to be about twice as large as the gap between rich and poor, but today the income gap is twice as large as the race gap. And Georgetown researchers found that in examining factors that influence SAT scores, socioeconomic obstacles are today seven times as important as racial obstacles. To be sure, there are still important differences between the typical life chances of black and white students of the same income due, for example, to housing discrimination. Controlling for income, black families have a lower net worth on average, and black children are more likely to live in high poverty neighborhoods. But smart class-based affirmative action programs can be structured to take account of these extra obstacles in a way that will increase racial diversity without explicitly counting race. 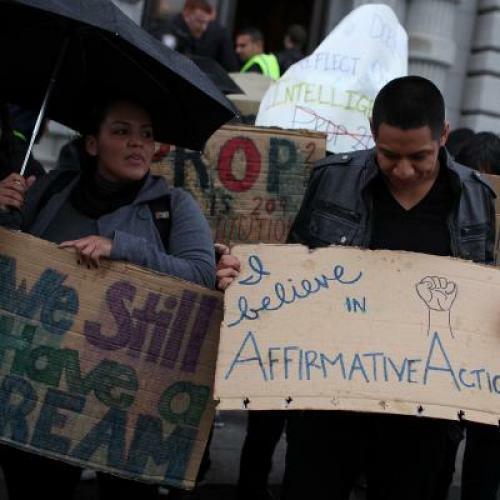 Why not support affirmative action based on both race and class? Universities have been saying for years that they consider both factors, and yet on the selective campuses, 86 percent of African Americans are middle or upper-middle class (and overall, rich kids outnumber poor kids by 25:1.) At most universities, it is only after the use of race was banned (in places like Texas, California, and Florida) that they stepped up efforts to admit low-income students as an indirect way of promoting racial and ethnic diversity. Legal observers almost universally expect the U.S. Supreme Court to significantly curtail, if not eliminate, racial preference programs in higher education. Does it make sense for the president to fall on his sword politically when a better alternative that addresses deepening economic inequalities in American life is readily available? Richard D. Kahlenberg, a senior fellow at The Century Foundation, is author of The Remedy: Class, Race, and Affirmative Action, and the editor of Rewarding Strivers: Helping Low-Income Students Succeed in College.